Y’all know me; I’m not much of a rules follower. Not even when it comes to self-imposed ones. But it was a good thing I stuck to the rule I recently laid down for myself: “If it ain’t actually raining, head to the dark site.” I pulled in a fair haul of Herschels this past Saturday evening despite poor weather. It wasn’t raining, but, aside from that, conditions were near about as bad as I could imagine. It was hazy, it was hot, it was buggy, and the second I stepped outside I was hit in the face by the smell of the crude oil clogging the Gulf of Mexico. Hot, yeah. I’ll say. We’ve had heat indexes of 110F+, and it ain’t even July yet. But if you live down here, you’ve learned to deal with the heat, if not like it. At least it would drop into the upper 70s by midnight—maybe. Bugs? The Thermacell keeps the worst of them away and frees me from having to slather on the DEET. 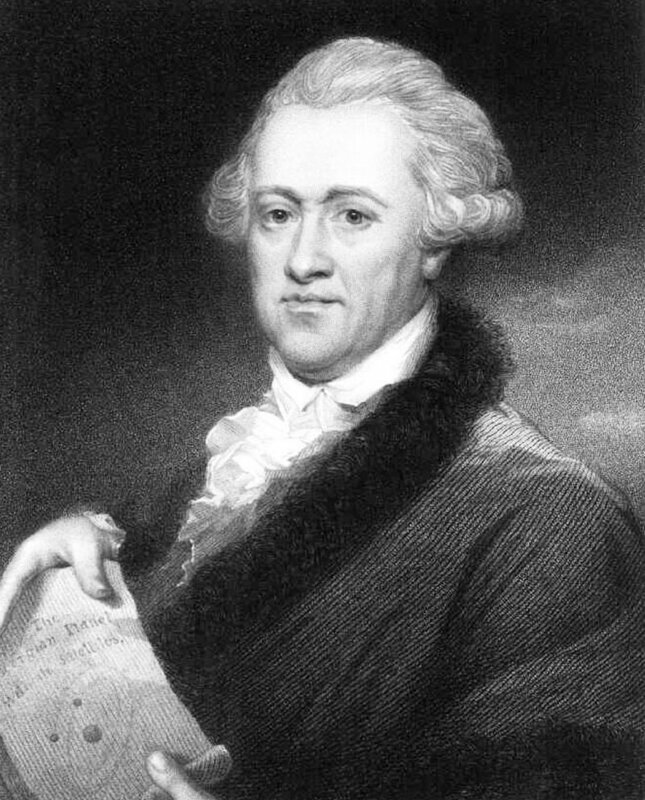 As for the oil, there’s not a hell of a lot we can do about that; I suspect it’ll be with us for quite a spell. While the Clear Sky Clock—err, “Charts”—showed plenty of near-white squares for transparency, the top row, the cloud cover row, was shades of blue. So, I’d give the ol’ Tanner-Williams site a go. But how? I could have done “simple and easy” with Charity Hope Valentine, my ETX 125, or the new long-focus refractor, Eloise, who’s come to live with us at Chaos Manor South (more on her some Sunday). “But.” June’s here, I’m seven months into the twelve months I’ve allotted myself for the Herschel Project, and I missed most of the Canes Ventatici objects due to clouds when I was Down Chiefland Way last month. This outing better be a full-bore Herschel run, then. What would that require? Given the conditions, I was pretty much assured I’d need the Stellacam II if I were to have a prayer of cutting through the haze to bring back 13th magnitude galaxies. I did wimp-out slightly: I left Big Bertha, our NexStar 11, at home in favor of Celeste, a 1995 Ultima C8 optical tube riding on a Celestron CG5 go-to mount. As you may have heard, a deep sky video camera can (at least) triple your aperture, and I figgered the 24 virtual inches the C8-Stellacam combo would give me would be sufficient to bring back my quarry if we weren’t completely clouded out. The C8 is less of a chore to haul out for a dark site expedition than the NS11, but, as you can see in the picture of stately Chaos Manor South’s front parlor, it still takes considerable gear to do an astro-video run. In addition to scope and mount, I need the camera, the portable DVD player I use as a monitor, the DVD recorder to capture my images, a PC to run NexRemote and SkyTools 3, two jumpstart batteries to power scope and dew heaters, a big trolling motor bat’try to power the DVD recorder, an inverter to feed the AC-only recorder, three accessory boxes full of Stuff, a camp table to put everything on, the PC shelter I use to keep dew off the electronics and shield my fellow observers from the (red filtered) screens, and various other odds and ends including the couple of cans of Monster Energy Drink I need to get through a summer deep sky crusade. 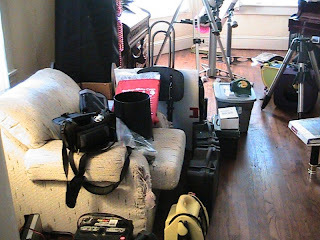 When I finally made up my mind to pull the trigger after waffling back and forth for a while about whether it was really worth bothering with all the junk on such a night, I loaded the astrostuff into the car with fair efficiency, but without hurrying in the heat. Even so, by the time I was done, I was soaked to the skin with sweat. This wasn’t exactly gonna be what you’d call a “comfortable” night. Oh, well. The die was cast. No pain-no gain, stiff upper lip and all that rot. After a pleasant drive of about an hour in the company of Garrison Keillor and A Prairie Home Companion, I arrived onsite, stepped out of the vee-hickle, and was descended upon by a cloud of mosquitoes, gnats, and even a wasp or two. First thing I did was get the Thermacell cranking, and after a few minutes it had chased the biting bugs off. Didn’t seem to have much effect on the annoying no-see-ums, though. Setup was uneventful. It was still in the upper 80s, but a light breeze kept me from succumbing to heat stroke. Done, I hooked my el cheapo Cobra GPS receiver to the netbook and let NexGPS get a fix. 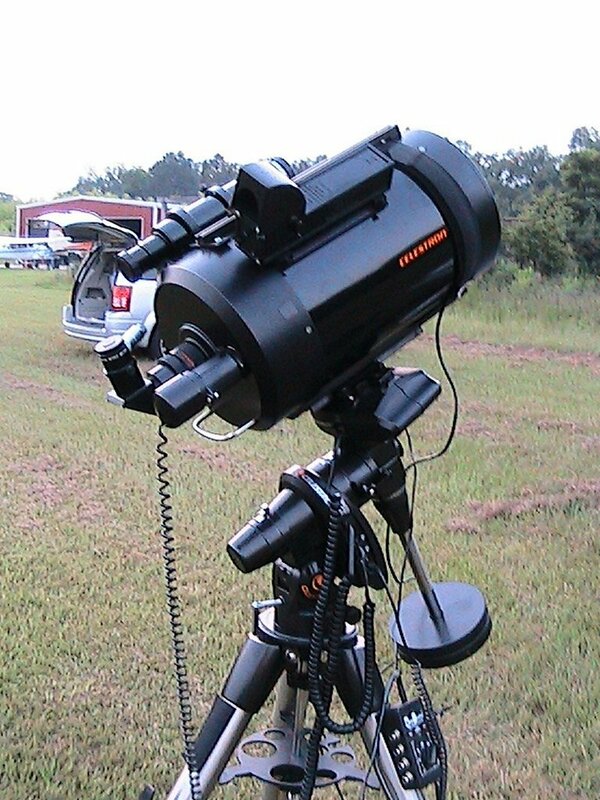 Tightwad that I am, I’ve never been able to convince myself to buy Celestron’s near-200-buck GPS receiver for the CG5. I mean, come on, GPS is convenient, but all it does for a German-type mount is save you a few keystrokes—you don’t have to enter latitude and longitude (NexRemote picks up time and date from the PC clock). Then, one day, I was browsing the dealer tables at the local hamfest and ran across a small GPS receiver with serial output for 25 bucks. Boom! I had GPS for the CG5. The NexGPS program, which comes standard with NexRemote, is simple to use and is maybe even more convenient than the Celestron CN16 receiver. Plug a serial-capable GPS into the PC’s serial port or a serial-USB converter cable, start NexGPS, and hit “connect.” You’ll begin seeing data flowing, and when the GPS has a fix, latitude and longitude will be displayed. You then save the position as one of up to four named “Sites.” When you start NexRemote, you right-click on the virtual hand control, pick “select a site” from the menu, and choose the appropriate location. If you come back to the same spot next time—at least within a mile or three—you don’t even have to connect the GPS again; just keep reusing the saved site. NexGPS is a great idea, really sweet, muchachos. Done, I waited for darkness. It was hard to tell what the sky would do as sundown came on. There was a line of clouds, but it extended no more than 10 degrees above the western horizon, not coming close to extinguishing beautiful Venus. Still, weather to the west is never a good sign here. Otherwise? Some cloud patches and a lot, and I do mean a lot, of haze. At least I didn’t have to wait out the clouds all by myself. One of our longtime PSAS members had braved the heat and humidity, as had a couple of new recruits. Sundown came and went, but I still couldn’t see Polaris. Which made it impossible to do a rough polar alignment by sighting through the mount’s empty polar bore (no squinting through a--probably misaligned--polar scope for this boy). So I waited. And waited. And waited. Finally, at about 9:45pm, I was able to line up the mount on the Northstar, boot-up the computer, and get the go-to alignment done. Or so I thought. The alignment started promisingly enough. Well, OK, anyhow. I had to bypass several stars with “Undo” to find one, Regulus, that was peeping through the clouds that were occupying most of the sky and slowly drifting north. Celeste made her usual weasels-with-tuberculosis sound (nearly as loud as Charity Hope Valentine) and headed that-a-way. I was a mite surprised she stopped as far from the target as she did—about 15 degrees—but, hey, this was the first time I’d used my new netbook computer with the CG5, and NexRemote didn’t have any stored alignment data from previous outings to work with. OK, star two…WHAT THE HELL?! Seemed as NR wanted me to line-up on Acrux. Purty obviously something was badly wrong if NexRemote thought that southern sparkler, which never rises from the latitude of Possum Swamp, ort-ta be visible. Hmmm…missed the first star by 15-degrees… That’s usually a sign of time problems. I checked time and date and found nothin’ amiss. Maybe a glitch? I started over. Again, when I said “start alignment,” NR asked about “Automatic Align.” Finally a light bulb, dim though it was, went off. AUTOMATIC ALIGN?! The CG5 ain’t got no automatic align. It ought to be asking about TWO STAR align! I exited to “settings,” corrected my faux-pas, reset the mount to its index marks and started all over. This time all was well. NR chose appropriate alignment stars, and by the time I got to the third of four possible Calibration stars, the target was in the eyepiece of the main scope when the slew stopped. After that, I ran the hand control's polar alignment routine and redid the go-to align one last time. I’d had to adjust the mount altitude and azimuth a considerable amount to bring the pole in, so my go-tos would have been off if I’d left things as they were. I reckon some of you are wondering why I bother with a good polar alignment. After all, the CG5 will put objects in the field of an eyepiece with the R.A. axis ten degrees or more away from the pole. The answer is “because I intended to image with the Stellacam II.” Even with the cam’s relatively short 10-second exposures, polar misalignment shows up as elongated, ugly stars. All that remained was to focus, which I did by mounting the Stellacam II on the rear cell and placing my Bahtinov Mask over the C8’s aperture. One nice thing this time out? I was able to sit at the video monitor and adjust focus. I finally got around to ordering a long extension cable for my JMI Motofocus hand control—I was way too lazy to make one myself. What luxury! When the spikes on the star were positioned as they are ‘sposed to be, I removed the mask, put my Dewstar dewshield back on the C8, and sent Celeste to M53 for a final focus/go-to check. Not only did M53 look way good, a sparkling handful of tiny rhinestones, it was smack in the center of the small Stellacam II chip. No, the CG5 is not an AP Mach 1 or even a Losmandy G11, but it is a good little GEM. In the five years I’ve had it; it’s never let me down. When I bought the CG5, I was skeptical. How could it be any good for the comparatively paltry sum Celestron demanded (it’s even cheaper five years later)? But it was. Its go-to is amazingly accurate, easily in the same league as the Celestron GPS and Meade LX200 scopes. Despite its light build and inexpensive nature, I’ve even taken guided long-exposure images with it that have pleased me. Lightly loaded with a C8 and the Stellacam II, it delivers very impressive results. One of the best buys I’ve made over my 45 years of amateur astronomy, to be frank with you-all. NGC 5023 (H.II.664) is not overly bright in the Stellacam II, but is attractive. It is an Scd edge-on of magnitude 12.85 and about 7.3’ across in images. Very pretty. An intermediate inclination magnitude 12.16 galaxy of type SA-r, NGC 4138 (H.I.196) is reputed to show a ring feature. There’s certainly no sign of that on the monitor. Small, bright nucleus. Some hint of a disk, but not much beyond that. NGC 5103 (H.II.665) is not much. On both its POSS plate and with the C8, it is a small 1.4’ Sab that’s slightly elongated and positioned near a bright field star. In images, NGC 5383 (H.I.181), a de Vaucouleurs SB(rs)b:pecSbrst, has the “Tie Fighter” look some barred galaxies assume. On the monitor, there are a few hints of the “wings,” but just a few. Given the low transparency, most of the time I see just a bright nucleus and a hazy outer envelope. NGC 5371 (H.II.716) is attractive. It’s a near face-on 4’ in size SAB(rs)bc, and despite poor conditions I can often see one hooked spiral arm and sometimes two. Not a whole lot to say about NGC 4369 (H.I.166), which is a magnitude 12.3 SA. An almost round fuzzy spot of a galaxy with a bright center and a dimmer, diffuse envelope. Poor conditions notwithstanding, NGC 4244 (H.V.41), the famous Silver Needle Galaxy, is bright and majestic. Stretches at least a third of the way across the screen and displays a tiny, bright nucleus. NED says there is nothing at this position, but SkyTools says “elliptical,” and that is what I see with the Stellacam. I presume this galaxy is indeed NGC 4912. It’s not overly interesting, but is prominent at magnitude 12.5 and has a bright core. Barely visible diffuse outer haze. NGC 4956 (H.II.413) is a face-on magnitude 13.3 lenticular, and there’s frankly not a lot to describe beyond that. With the C8, it is a fuzzy star less than 1’ in diameter and that is it. The same goes for NGC 5444 (H.II.417), a magnitude 12.8 E+ galaxy 1.65’ across its major axis. Onscreen it’s a slightly elongated, slightly fuzzy star. 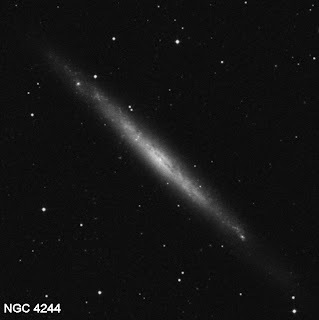 NGC 5445 (H.III.413), an edge-on lenticular, is 6’35” to the south-southeast of 5444. It is small at 1.65’ long (in pictures), but it’s very clear what it is, a razor sharp little sliver of a galaxy. Possessed of a bright core, it is quite lovely. NGC 5440 (H.II.416) is an Sa spiral, but in the C8 it’s just a bright nucleus with an elongated outer envelope and that is all. On the POSS and on the monitor, it’s hard to tell what is going on with NGC 4395 (H.I.29). It’s classified as a SA(s)m, and displays a weird, irregular, spotty appearance. NGC 4291 (H.I.275) is a small, round magnitude 1.4 fuzzie. It is in the same field as NGC 4319 (H.I.276), which is elongated. NGC 4133 (H.I.278) is marginally interesting at best tonight. Small SABb about 2’ across its longest axis. Intermediate in inclination, and I occasionally see a suggestion of spiral detail. A “good enough” face-on SA(s)0 of magnitude 11.87, NGC 6340 (H.II.767) doesn’t show much in the way of detail other than that it brightens gradually toward its middle. There is a magnitude 11 – 13 double star 1’42” to the galaxy’s north-northwest. NGC 4250 (H.I.264) is nice. In images, it’s another Tie Fighter, and I occasionally catch sight of those details in this SAB (r) 0. Lovely NGC 4236 (H.V.51) is large at 21.9’ x 6’. 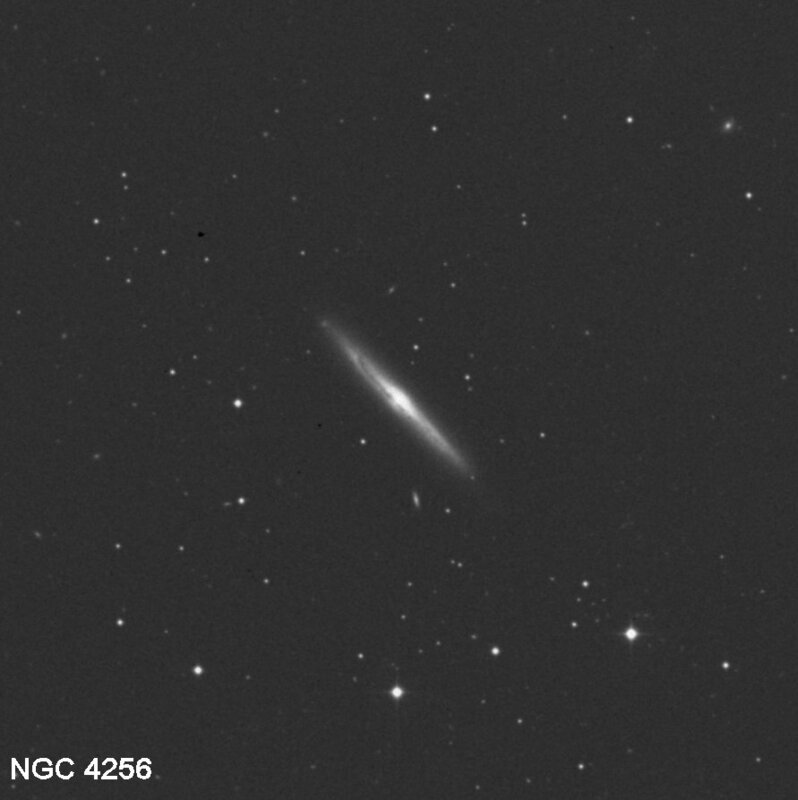 What I can see of it looks a little like NGC 253, though in deep images this SBdm seems to show a set of far flung spiral arms more like M81. NGC 3682 (H.I.262), in contrast, is a whole lot of nothing. 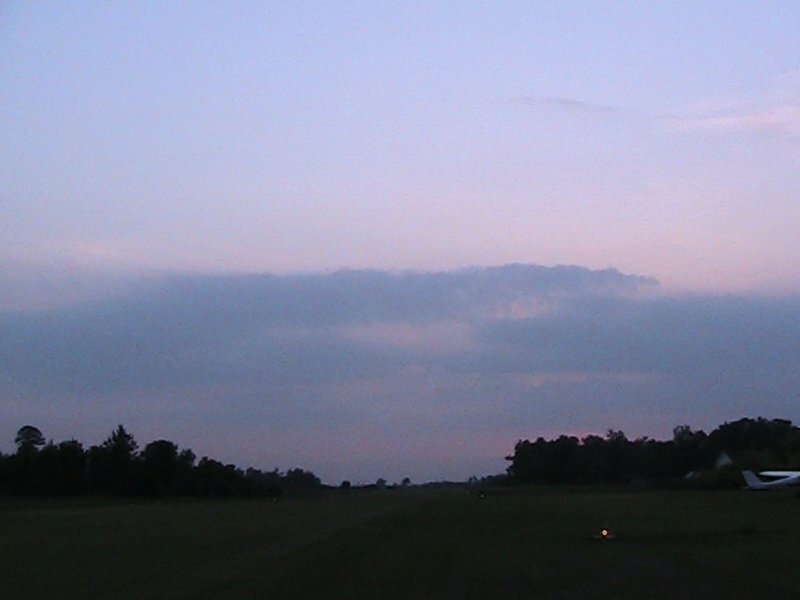 A lenticular, an SA (s) 0 of intermediate inclination, it’s obviously elongated with a large central area and a fairly extensive outer envelope, but nothing more than that is visible. NGC 4256 (H.II.846) is a skinny sliver of an incredibly beautiful edge on SA(s)b spiral. Large, 4.5’ in images. I occasionally think the Stellacam shows hints of an equatorial dust lane. An SA(s)cd, NGC 6015 (H.III.739) is quite the attractive spiral. Definitely shows arm detail, no doubt about that. 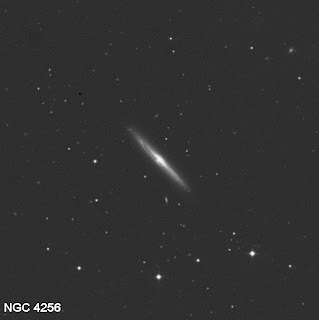 NGC 5985 (H.II.766) is good-looking in images, where it resembles a smaller M81, and it shows some hints of that on my monitor. It is in the field with two other bright galaxies, fuzzball NGC 5982, which is 7’26” to the northwest, and a pretty edge on, NGC 5981, which is 6’18” further northwest. The last Draco resident, NGC 5879 (H.II.757), is lacking in detail. It’s a skinny thing on the monitor despite its intermediate inclination, and shows a bright core and a substantial haze surrounding that, but I don’t see any indication of other features in this SA(rs)bc. NGC 6155 (H.II.690) is unprepossessing, a bright nucleus surrounded by some haze. NGC 6239 (H.III.727) is a an oblong-shaped magnitude 12.9 sprite of an SB(s)b pec that’s probably suffered an interaction with another galaxy. Planetary nebula NGC 6058 (H.III.637) is the first and only non-galaxy Herschel object tonight. Small (25”) but easy to identify. It shows a magnitude 13.9 central star and some suggestions of an annular shape. NGC 6166 (H.II.875) is a bright elliptical in a field full a little MCG and PGC ghosts. 6166 is elongated, 1.9 x 1.4’, and has a magnitude of 12.78. NGC 6181 (H.II.753) is an interesting SA(rs)c that shows definite spiral detail with two loose arms. NGC 6548 (H.III.555), a good looking S0 lenticular, shows a bright core and a spindle-shaped disk. The last Hercules H II, NGC 6106 (H.II.151), is an SA(s)c of intermediate inclination to us. Bright middle that tapers off to a diffuse, elongated haze. Oval shaped, 2.5’ x 1.4’, and reasonably bright at magnitude 12.8. I don’t see any signs of the multiple arms it shows in long exposure images, however. NGC 5061 (H.I.138) is still above the horizon—barely. This bright (magnitude 11.44) and big (3.5’ x 3.0’) E0 elliptical is reduced to a small fuzz-spot by its low altitude. Why only one Hydra fuzzy? Due to clouds to the southwest, I’d had to wait way too late in the evening to visit the watersnake. 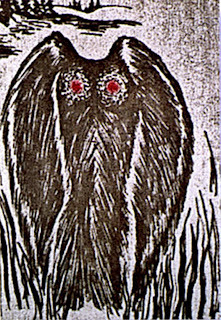 By 11:30 p.m. he was diving beneath the horizon, and, with a flick of his lustrous tail, was gone. This may be a problem. I really need to hit the twelve remaining Hydras next month, and even then it will be a near thing. I didn’t do the constellation last month while I was down in Chiefland because it was invariably cloudy in the Snake’s part of the sky. Worse comes to worst, I should still be able to finish the H-Project by November if’n I stay up real late and catch the dang reptile on the flip-flop before dawn. “That sound ain’t no possum, Unk. 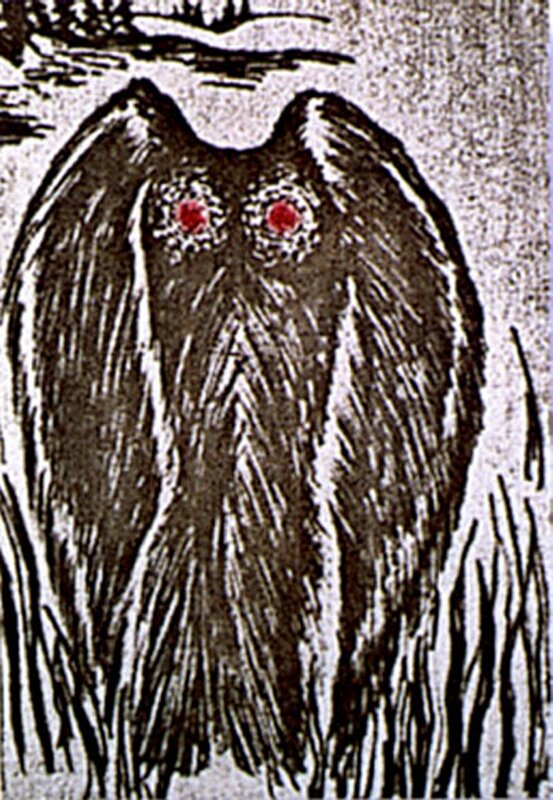 It could be THE MOTHMAN. Oh, and you know THE SKUNK APE LOVES THIS PART OF THE COUNTRY. What’s THAT? Is that an innocent satellite yonder OR IS IT THE SHIP OF THE LITTLE GREY DUDES FROM ZETA RETICULI II? Maybe THE DELIVERANCE GANG is—err—“bringing up the rear?” Hark! Is that a banjo I hear? Sigh. When I get like this, I know it’s useless to try to do any more work. I can’t concentrate when I’m listening for approaching footsteps and wishing for my shooting iron. The facility we use is safe as milk, with its good and friendly residents just meters away. That knowledge didn’t help: “But Unk, I’ll bet them li’l grey sumsabeeches wouldn’t have no trouble at all ABDUCTING YOU before you could so much as squeak. Sheesh! Embarrassing? A little. But I suspect more of us get spooked during solo observing runs out in the boonies than care to admit it. Leastways, it was clear my near case of the screaming meemies was mostly brought on by physical factors. I sat in the loaded car for a few minutes with the air conditioner blasting, drank a bottle of water, and was feeling like my old self directly. Good enough that I located my flashlight, got out of the car, and made a quick scan of the area for dropped items before departing. I did leave the door open and the engine running, mind you, but that was purely for convenience’s sake, doncha know. So how was your Saturday night, muchachos? Hey Unk, you're not the only one who gets spooked! Your description is right on with how my brain works when I'm the only one left on the observing field - only my boogyman is generally an imaginary bear or mountain lion. Funny how just one companion completely puts me at ease. Like Howard said...having one person with you in the boonies can make all the difference.....especially if they are slower than you!!! Still, a sidearm provides me with nearly as good reassurance. Good Luck with the Hydra!